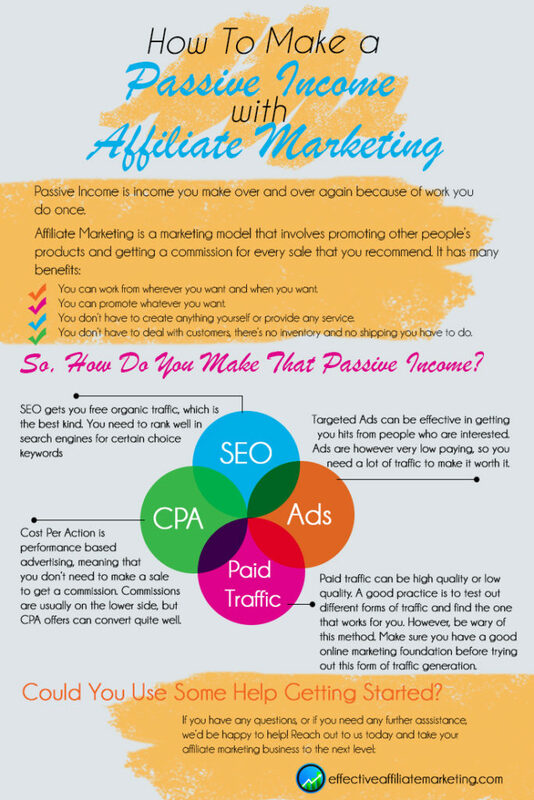 Ways To Make A Passive Income With Affiliate Marketing – Is Passive Income A Myth? Starting a conventional business takes way too much investment upfront, not to mention time and energy. You get to be selective about the particular products you’re going to market. You can choose to focus on any niche you want. You can sell info products that can be downloaded or physical products for major corporations. Heck, even Wal-Mart has an affiliate program! You can make as much money as you want to. You can choose to go with low commission products or high commission products. Low commission products typically have a higher chance to convert. Higher commission products require more time and effort, but don’t have to convert as high in order to make a lot of money. You can create an email list in order to market other products to your niche, or products that you to create yourself. This is how you build a real business. You capture names and emails so you can have the chance to build a relationship with people first. Email marketing is one of the many effective strategies of affiliate marketing. I want to convey to you that not only are there several ways to make passive income with affiliate marketing, but it can be done with little to no money if you want. In this article I am going to talk about several things such as what passive income and affiliate marketing are. We’ll also get into the things you have to have in order to be successful with affiliate marketing and exactly how you go about actually earning money. The first thing we want to get into is exactly what passive income is. I define it as income you make over and over again because of work you do once. As an example, you write one review. It makes it to the first page of google. It gets read hundreds of times over the next months. You make commissions for all those months from this one review you wrote. Now I don’t want to create the impression that it’s a completely lazy way to make money, because it’s not. You’ll have to put in a certain amount of work on the front end and once things get rolling money should continue to come in with minimal time and effort from you. Passive income also has the potential to be scaled without requiring more time and effort, just more money (by hiring people to write content and do daily repetitive tasks). Posts and articles-You’ll write content geared towards a certain audience, build traffic and then find different ways to monetize it. Videos-These work the same! you monetize the traffic you’re able to generate. Email list – Completely automated way to interact with your audience. You can schedule when emails will go out with helpful information and a few recommendations peppered in between. These are just a few short examples, but affiliate marketing itself is probably one of the ultimate ways to generate passive income, once you get it going to where you can automate the majority of it. This takes time though. In the beginning you’ll have to be more active. If I want to sell a product or service, usually I have to be the person who owns that product or service right? Not only this but depending on what I’m selling I’ll need to have a lot of credibility and reputation. Certain products or services I might want to sell will require a lot of time to provide or develop and this is where discouragement can set in. With affiliate marketing you don’t have to worry about any of this as you have a whole lot more leverage. Here are some of the specific perks to being an affiliate marketer. You are promoting other people’s products and getting commissions for every sale that you recommend. You can work from wherever you want and when you want. We’re not just talking about from home, but anywhere in the world and on your time. You can promote whatever you want. You have no limitations, you can leverage the credibility of the product/service provider or creator to generate sales. You don’t have to create anything yourself or provide any service. You don’t have to deal with customers, there’s no inventory and no shipping you have to do. The amount of work you have to handle is minimal. Most of the work you’ll be doing will center on driving traffic in different ways. Before we get into the basic must haves you need in order to be a successful affiliate marketer, I want to discuss the type of attitude you need. Your attitude is going to need to be one that focuses on the process. You’re trying to drive targeted traffic and then convert it into sales. This is a skill and it can take time to build up. The good news is there’s so much free content on the web that can help you in this area that there’s no excuse to fail. A blog-This is where you’ll create content geared towards a certain niche in order to get targeted traffic you can leverage. We’re talking about being able to gain readers and to spread your content in order to increase overall traffic very fast to your blog. Targeted traffic of course-This is the heart of affiliate marketing. Affiliate marketers who can drive traffic to a high degree are almost always successful. It’s because of this that they make a lot of money. If you can master this one thing, then it’s going to be hard for you to fail. HOW DO YOU MAKE THE PASSIVE INCOME? Paid traffic-There are different forms of paid traffic with some being high quality and others being low quality. You’ll need to have incremental budgets in order to test out different forms of traffic so you can see which one works best for you. When you find something that works you can then put more money into that one source. Ads-Ads in general are effective, but they must be placed in the right areas. You would want your ads to be in places where the traffic is targeted. This is going to ensure that when you do get hits it’s coming from people who are interested in what’s being promoted. Ads in general are a low paying method so you need a lot of traffic to make it worth it. If you do have a lot of traffic, this is the most “hands-off” and passive method to make money online. CPA-If you really want to control risk, then CPA (cost per action) advertising is for you. This is performance based advertising, meaning that you don’t necessarily need to make a sale to get a commission. As an example, you can make a commission for getting your readers to fill out a survey. Commissions are usually on the lower side, but CPA offers can convert quite well. You would make up for the low commissions with more conversions. SEO-organic free traffic is, in my humble opinion, the granddaddy of them all in terms of traffic. If you can rank in search engine for certain keywords, then you’ll get lots of free traffic every day and the amount of passive affiliate income you can make will depend on the effectiveness of your monetization methods. This is the main method I use in my online business! Passive income with affiliate marketing is very possible. You can use free methods of traffic to get yourself going and then leverage any income you make to test paid traffic sources. As mentioned before nothing is truly passive, you’ll still have to manage your business. However, the scalability potential you have and the time required to operate things overall can be minimized. Bottom line, you can make a ton of money with affiliate marketing without working 40 – 80 hours a week. COULD YOU USE SOME HELP GETTING STARTED? A few sections above I mentioned that affiliate marketing required a blog, content and traffic. What if I told you that you can get step-by-step instructions on how to achieve those needed essentials? And what if I told you that you could access them for FREE? There is no need to break out a credit card and there is no limit to how long you can be a free member. CLICK HERE TO START BUILDING YOUR AFFILIATE MARKETING BUSINESS FOR FREE! I hope you found this post useful. Please leave any questions or comments below. I will try to answer as soon as I can. Passive Income From Blogs – What You Need To Know! This is great information! I love the way you present the key details of what a person would need to do this, then lead them to where they can find all of those things in one place. Awesome job! Thanks Cristy! It is fairly straightforward. With a good blueprint, hard work and a little patience the sky is the limit! People don’t understand the beauty of having a passive income. For those that see it, good for you! Everyone today wants more time with family and fun to enjoy life while there young and not be restricted by there jobs work hours. Well this is the kind of path that is going to get you there. I think you explained this perfectly!!! Thanks for the comment Bruce. Passive income is definitely the way to go. Most wealthy people do not trade time for money. They target passive income to generate their wealth.